Employees with disabilities can face many challenges within the workplace. Our earlier data insight on ‘Workplace Cultural Diversity and Inclusiveness Part 2’ showed that employees with a disability are more likely to report experiencing discrimination at work and to perceive disability as a barrier to workplace success. However, there are many actions that employers can take to greatly improve the wellbeing of employees with disabilities in their workplace. These, in turn, create positive flow on effects to overall workplace wellbeing and productivity. Unsurprisingly, employees with a disability who require reasonable adjustments, but do not receive these, have more negative perceptions of their workplace. For example, 67 per cent of those without a disability are satisfied with their jobs, compared with just 26 per cent of those who require but do not receive reasonable adjustment. However, for those with a disability who request reasonable adjustment and are satisfied with the process, perceptions of their workplace improve significantly, approaching or equalling the levels of those who do not have a disability (Figure 1). The People Matter Survey revealed that almost a third of people with a disability didn’t feel comfortable to disclose their disability to their employer. Of these, 41 per cent did not disclose because they felt their disability would have reflect negatively on them. 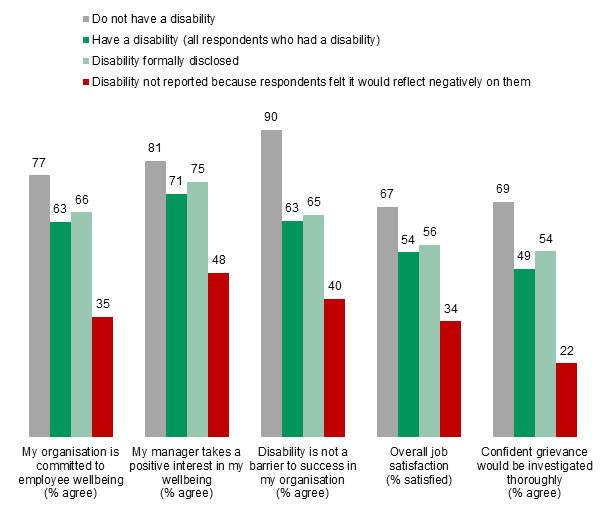 Figure 2 shows that this group of people, who are working with the belief that their organisation has a negative view of disability were, unsurprisingly, dissatisfied across a number of workplace indicators. Formally disclosing a disability is a reflection of the trust employees have with their organisation. Figure 2 shows that those employees who did disclose expressed more positive views across a number of workplace indicators. Promoting positive messages about how the organisation values diversity, and particularly people with a range of abilities, may result in better workplace experiences for this group of people. It may increase disclosure of disability by improving confidence that having a disability is not seen as a negative. These messages however need to be backed by action, with workplaces making reasonable adjustments to accommodate the needs of staff with disabilities. Research suggests that the average ‘reasonable adjustment’ costs less than $500.2 This is a small price to pay to achieve significant benefits for employees with disability and the workplace – not to mention to ensure that legal obligations are met. Using inclusive, non-discriminatory language in all communications. A total of 1,875 (or 3.3 per cent) respondents to the 2016 survey had a disability. For the 2015 survey, a total of 912 (or 2.9 per cent) respondents indicated that they had a disability. A total of 31,818 staff employed by 116 public sector organisations participated in the 2015 survey, achieving an overall response rate of 35 percent. The additional questions about disclosure of disability status and need for work adjustments, discussed in this paper, were asked to 428 respondents to the 2015 survey working for public service departments who indicated that they had a disability. Noon, M & Ogbonna, E. (eds) (2001). Equality, Diversity and Disadvantage in Employment. At http://www.palgraveconnect.com/pc/doifinder/view/10.1057/9780333977880. Accessed October 2016. Screen reading software for employees with vision impairment. Source: See DHHS website – People with a disability in the community/equitable employment. At: http://www.dhs.vic.gov.au/for-business-and-community/community-involvement/people-with-a-disability-in-the-community/equitable-employment/equitable-employment-practices/reasonable-adjustment. Column chart demonstrating the impact that making satisfactory reasonable adjustment has on perceptions of workplace commitments to employee wellbeing, barriers to success, employee satisfaction, and grievance processes in 2015. There is a clear trend that shows that those with a disability are more likely to have negative perceptions of their workplace than those without a disability. However those who have a disability and have had a required adjustment made that was satisfactory were less likely to have negative perceptions of their workplace, particularly compared to those that did not have an adjustment made. The chart has 4 identifiers – Do not have a disability, Have a disability, Have a disability, required adjustment made and satisfactory, and Have a disability, adjustment not made. These identifiers are duplicated over 5 categories of response – My organisation is committed to employee wellbeing (% agreement), My manager takes a positive interest in my wellbeing (% agreement), Disability is not a barrier to success in my organisation (% agreement), Overall job satisfaction (% satisfied), and Confident that if I lodge a grievance it would be investigated in a thorough and objective manner (% agreement). Numbers are expressed as a percentage of all responses. Column chart demonstrating the impact that living with a disability has on perceptions of workplace commitments to employee wellbeing, barriers to success, employee satisfaction, and grievance processes in 2015. There is a clear trend that shows that those with a disability are more likely to have negative perceptions of their workplace than those without a disability, but that those who have a disability and have not reported it to their employer because respondents felt it would reflect negatively on them are even more likely to have negative perceptions of their workplace. Those who have formally disclosed their disability are slightly less negative than all those who have a disability. The chart has 4 identifiers – Do not have a disability, Have a disability, Disability formally disclosed and Disability not reported because it would reflect negatively. These identifiers are duplicated over 5 categories of response – My organisation is committed to employee wellbeing (% agreement), My manager takes a positive interest in my wellbeing (% agreement), Disability is not a barrier to success in my organisation (% agreement), Overall job satisfaction (% satisfied), and Confident that if I lodge a grievance it would be investigated in a thorough and objective manner (% agreement). Numbers are expressed as a percentage of all responses.